The cooks. Click on the picture to see a larger version. 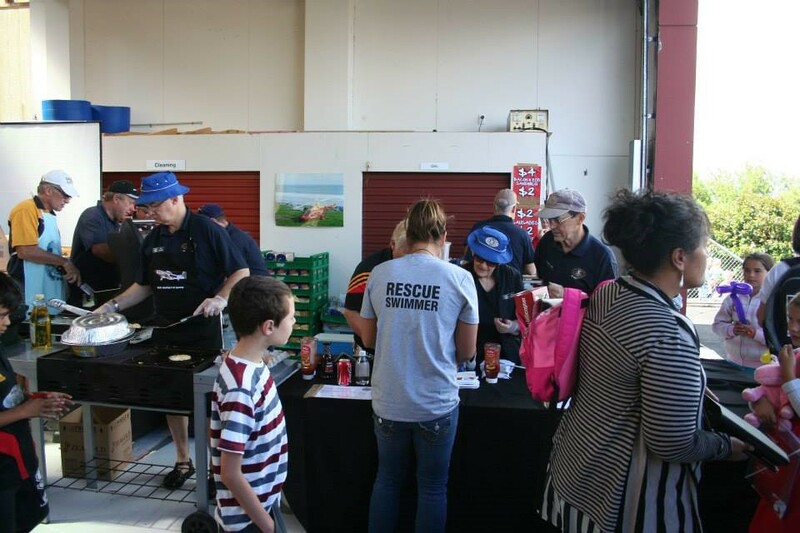 The Waikato Westpac Rescue Helicopter Trust holds an open day every year to inform the public of what they do and to raise funds. They attract a large and hungry crowd so part of the fund raising is to cook and sell food and soft drinks. 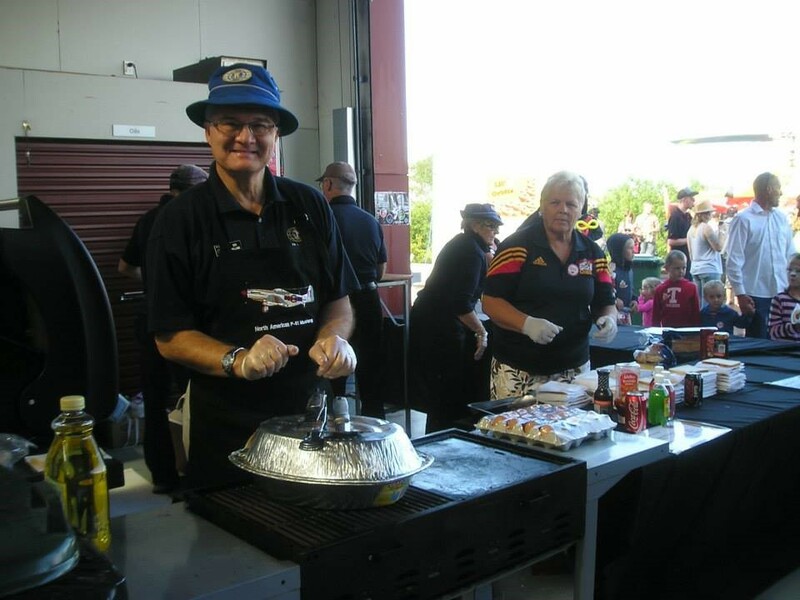 The barbecue is normally manned by volunteers from our sister club in Hamilton, the Kiwanis Club of Westside Hamilton. 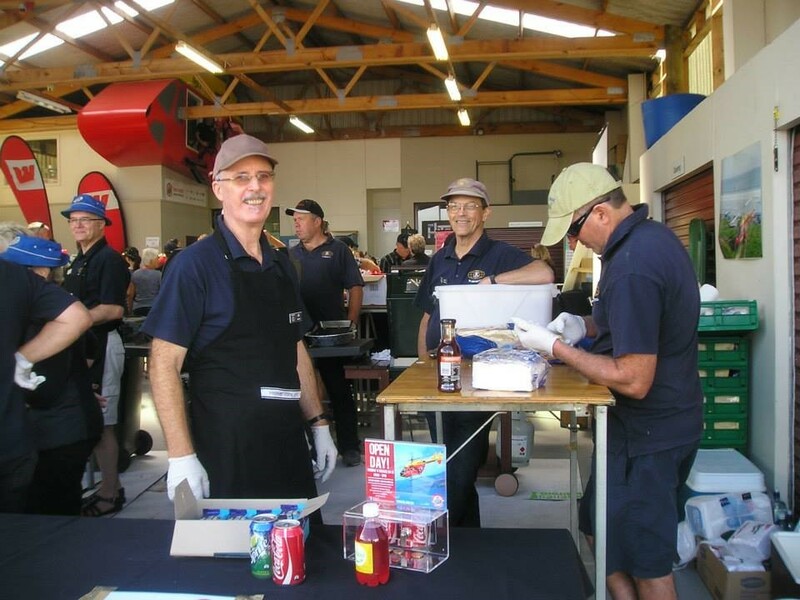 But in 2015 that club was double booked for this event and another major project so the Kiwanis Club of Te Awamutu stepped in to feed the masses. Equipment and food was provided by the Helicopter Trust and all funds raised went directly to them. We had a good time fixing up tasty dishes and even got to see the main helicopter take off on an urgent rescue mission during the event. The back office support.Click on the picture to see a larger version. The serving crew.Click on the picture to see a larger version. The hungry customers.Click on the picture to see a larger version. 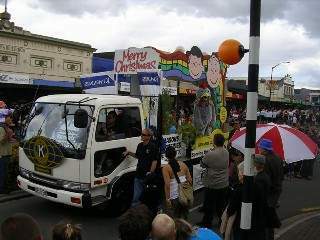 The Te Awamutu 2006 Christmas Parade - First Prize! 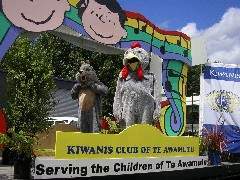 Christmas 2006 was the first time Te Awamutu Kiwanis had entered a float into the annual town Christmas Parade. After 70 odd man hours a float was constructed and the results, as you can see, were very pleasing. Project Manager Mark Wolfe got the best out of the team turning his idea into a reality. Parade Day was a blast, the chipmunk and the rooster had the Kids laughing and squealing with delight, as their antics disrupted the preparation of a number of nearby entries into the Parade, who were trying to get the children organized. Winning the coveted 1st prize in the Community Group Section was a surprise bonus, as most of us never knew we were going to be 'judged' for our efforts. The crowds that lined the main streets of Te Awamutu (yes we do have a couple) were enthusiastic with their applause and cheering as we went past. The chipmunk and the rooster needed little encouragement to act like idiots, and, to the crowds delight, they did act like idiots. It was a very successful project, and the name of Kiwanis was proudly put out in front of our local community for a good couple of hours, and we even got coverage in the local 'rag'. Special thanks to Mark W. and his willing team of workers, especially Richard for the base to work from, Mark I. for the use and abuse of his truck, Kevin and Grant for being the 'idiots' they are and for Che's artwork. In 2007, we entered a slightly modified float in the town's Christmas parade and again took first prize in our class! Our club has entered a float every year through 2014. Our efforts have not always garnered the prizes but we and the watching kids have always had fun. It has been known to rain in our area. This may account for all the green grass. But when it rains, the kindergarten kids in the Te Awamutu suburb of Kihikihi had no place to play except within the limited confines of the classroom. A large patio was available but this had no roof. The kindergarten committee had funds for materials to roof the patio and create a veranda but could not afford to hire the labor. 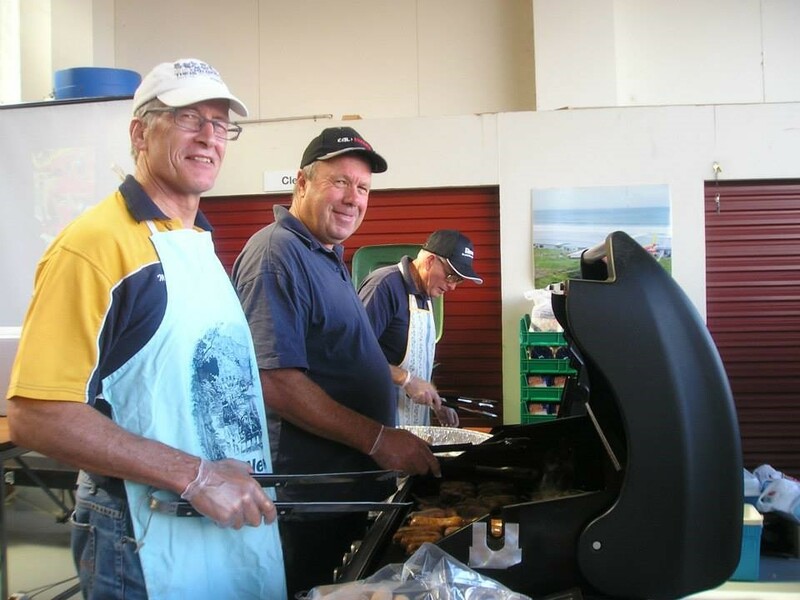 Te Awamutu Kiwanis to the rescue. 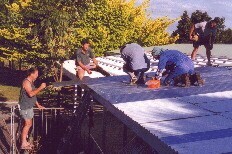 In November and December of 1999, club members built a strong supporting structure, over the patio and roofed it with a combination of translucent plastic and iron corrugated sheets. The building of the Te Awamutu skateboard park was an excellent example of cooperation between service clubs, local government and the community. 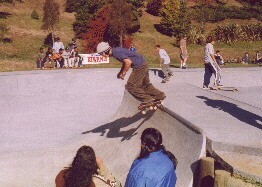 The park was conceived by the local skateboarders and their parents, championed by Kiwanis Past President Ian Kay, funding and construction managed by an ad hoc board with representatives from Kiwanis, Lions, the Community Board, the District Council and the skateboarders themselves. Design was done by a local architect with copious input from the skateboarders. Funding came from local businesses (largely in the form of reduced price materials and labor), the Community Board, the Lions Club and a raffle run by the service clubs and the skateboarders. The land was made available by the Parks Department of the District Council. The basic land shaping was carried out by a local earth moving company and the extra hard concrete was poured and shaped by a local specialist company but all the other work was done by members of the Lions Club and the Kiwanis Club of Te Awamutu (with help from the skateboarders). The gun skateboarders of the area assure us that the resulting facility is one of the better skateboard parks in the Waikato area. In terms of the benefit to and appreciation by the community, this project has proven to be one of the best that our club has been privileged to be associated with. It is in constant use, day and night. Matariki Hospital is a small maternity and geriatric care facility in Te Awamutu. In 1999, in cooperation with the Kiwanis Club of Montville Township, New Jersey, USA, the Kiwanis Club of Te Awamutu was able to gift a bright wall mural to the hospital to brighten the lives of staff and patients there. In February of 1999, our club's webmaster received an unsolicited email from Arlene Sullivan from the Kiwanis Club of Montville Township in New Jersey in the United States. She had picked up the email address from the Te Awamutu club web pages. She wrote that one of her club's projects was to sponsor community organizations to paint bright, colorful murals to brighten up the rooms in hospitals and other institutions. Arlene asked if we knew of any such institutions in New Zealand that would like to have a mural on the wall, free of charge and postage paid. She referred us to the web pages of her Changing Images Foundation to get an idea of what we could expect. 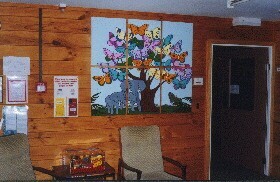 Our club discussed this generous offer and to make a short story even shorter, there is now a bright butterfly mural hanging in the reception of the maternity ward of Matariki Hospital in Te Awamutu. The mural was painted by a community recreation group for citizens with handicaps in Montville Township. This has been an excellent example of international cooperation in service projects between remote Kiwanis clubs. The hospital staff (and hopefully the patients) were very pleased indeed with their new acquisition. Page last updated by webmaster@kiwanis.org.New Zealand (David Fentress) on 17 October, 2016. Your comments, questions and suggestions are welcome.